I’ve come to the conclusion that the Paper Mario series is effectively a vehicle to show off Nintendo’s writing. I’m working my way through the much-vaunted Thousand Year Door right now, and while the battling is reasonably compelling and the visuals are lush, the writing is what pulls the player forward. It’s peculiar, because it’s not even the story, really. The plot of that game amounts to the bog-standard save the world/save the princess narrative. Instead, it’s the amount of detail given over to the characters and their world that establish the game’s great reputation—a land-speculating, monocle-wearing Bob-Omb in Glitzville; an extensive sideplot where Luigi recounts offscreen, likely-fictional adventures next to a sidekick who’s always ready to deflate him; ravens who speak only to themselves but have much more informed opinions of the state of the world than its “higher-functioning” residents. Happily, it’s the writing that has me ready to jump into Color Splash. Just watching the videos posted by Nintendo and GameXplain, I’ve enjoyed laughing out loud at the antics of high-fallutin’ Snifits who look down their noses at the similarly attired Shyguys, nondescript Toads who take pride in Mario paying attention to their otherwise unremarkable existence, and hammer brothers speaking in youth slang of the 1950s. 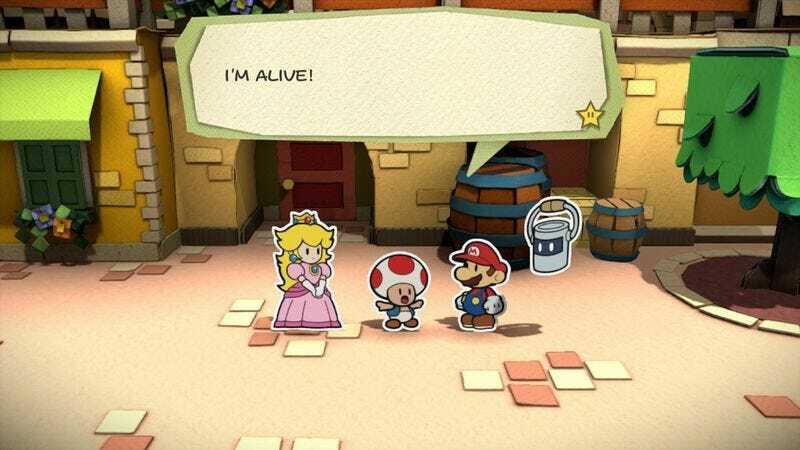 This was the element lacking from Sticker Star, and I’m quite excited to see it make a return to the series after being such a factor in earlier Paper Mario games. I don’t mean to sound like an ad for the game—it’s clearly got some issues, as indicated by the Zack’s review—but it’s nice to see Nintendo identifying their best asset in the series and putting it front and center for the new iteration. I very much agree with this, and it goes back to the original Super Mario RPG as well. I caught up with it again recently thanks to a speedrun, and despite the player rushing past text and plot, I still laughed once again at the jokes. The version of Mario in RPG might be my favorite. He’s silent and heroic, as always, but still displays a lot of character. In fact, his silence is taken out of the usual “heroic mime” trope and becomes a quirk in itself, since rather than not expressing himself at all, Mario communicates with crazy, physics-defying charades routines. That’s not to say the oither characters aren’t fun to be around—the version of Bowser we see in Mario & Luigi and Paper Mario is codified here, and even the ever-serious Geno is interesting and quirky—but hey, Harpo always was my favorite Marx Brother. Since it’s bound to come up, I just have to say it: I loved Sticker Star. It was a weird, intentionally obscure mishmash of genres and ideas that felt thoroughly Nintendo, and I hate that its legacy is so negative. I mean, I get it. It’s almost confrontationally different. But the things that are supposedly flaws—the lack of experience points, attacks being a limited resource, the linearity—are the things I love about it. The battles are “pointless” in the same sense that enemies in Super Mario Bros. are pointless. They are obstacles you have to overcome to get to the goal. Instead of stomping on their head, you fight them in turn-based RPG style. I’ve loved all the Paper Mario games. They’re ambitious and intentionally subvert RPG conventions. I’d love another entry like The Thousand Year Door, but I’d love something new even more, so I’m excited for Color Splash. The real thing that was revolutionary, which people usually gloss over, is that the story wasn’t just told in first-person but in unbroken, seamless first-person. Apart from moments when Gordon Freeman is knocked out or otherwise incapacitated, there are no scene breaks, cuts to black, or interludes. Other FPS games were basically a collection of individual levels, usually with a button or a switch at the end that took you to the next level (see: Wolfenstein 3D, Doom, Quake, Duke Nukem 3D), whereas HL1 (and many modern games) feel like one big unending level. Each zone connects to each other as seamlessly as technology would allow at the time, so from the moment you ride the tram into work (and even that tram sequence was revolutionary) to the final moments of the game, you’re with Gordon every step of the way. What stuck out to me was the way blood splattered. I know, it’s immature, but it might have been the first time I played a game where every firefight felt unique, with guys attacking at different angles, blood splattering all over the place and grenades going off. When the bullets stopped flying it did look like a battle took place. We take that for granted now, I guess. For years I have been thinking about what exactly makes Half-Life 2 so special to me and what prompts me to replay it once every four years. Is it the sound? Is it the pervasive sense of isolation, because this is one of the few games which stresses the impossible burden which the character must take? (I remember the way the water drips off the walls in the sewers, and this sound still fills me with unaccountable dread.) Is it because of the intuitive way the levels are structured, so that even when you are navigating City 17’s outskirts, you still have a clear sense of where you are and where you should go? To my mind, less than a dozen shooters in the history of video games achieved that kind of spatial coherence. Because the space feels so real, so uninterrupted, the passage of time feels real as well. This is one of the few games where you feel the urgency of the situation, and where your actions seem to instigate events beyond those that you directly observe. Half-Life 2 succeeds at conveying the tricky sense of being at once the catalyst of seismic changes in the surrounding world and an organic part of them. That does it for this week, Gameologerinos. As always, thank you for reading and commenting. We’ll see you all next week!